Announcing the CouchWarriors schedule of events for 2015! 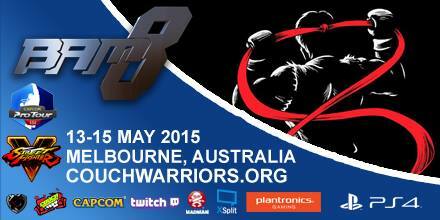 We had a brilliant 2014 with fantastic ranking battle attendances each month, a gangbusters national event in BAM6. We also added Meet N Mash Friday weeklies in the city and hosted tournaments at events like CHAOZ, ANIMAGA and of course PAX AUSTRALIA. We’re proud to be supporting the fighting game community and looking forward to a fun fighting game filled 2015! We hope to see you at one of these events to compete, learn to play or just have some great sets in your favourite games. We can confirm the first SIX MONTHS of 2015 tournament dates have been booked, on a Saturday every month at our regular Brunswick hall venue just off Sydney road, next to convenient train and tram transport and plenty of parking. Prizes and medals! We’ll do the same this year. There may be prizes at some of the monthlies as well in addition to the pot prizes. Stay tuned. We’re all volunteers and always appreciate help from people who want to contribute, which in turn helps the whole community. Want to take part and help keep these great events running? Just bringing your friends to play your favourite game is a big help! As a not for profit community organisation, we have a committee and elected official positions. We would like to announce the 2015 officer positions, and some highlight community roles.